Airway epithelial cells play an important role in the pathogenesis of inflammatory lung diseases such as asthma, cystic fibrosis and COPD. Studies concerning the function of the lipid metabolism of the airway epithelium are so far based only on the detection of lipids by immunohistochemistry but quantitative analyses have not been performed. Although recent advances in mass spectrometry have allowed to identify a variety of lipid classes simultaneously in isolated tissue samples, up until now, these methods were not suitable to analyze lipids in the airway epithelium. To determine all major lipid classes in airway epithelial cells, we used an LC–MS-based approach that can easily be combined with the specific isolation procedure to obtain epithelial cells. We tested the suitability of this method with a mouse model of experimental asthma. In response to allergen challenge, perturbations in the sphingolipids were detected, which led to increased levels of ceramides. We expanded the scope of this approach analysing human bronchus samples without pathological findings of adenocarcinoma patients. For the human lung epithelium an unusual lipid class distribution was found in which ceramide was the predominant sphingolipid. In summary, we show that disease progression and lipid metabolism perturbation can be monitored in animal models and that the method can be used for the analysis of clinical samples. Lipid species are abbreviated as follows: [abbreviation of the lipid class] [sum of carbon atoms in all fatty acid residues]:[number of double bonds], e.g. PC 36:1 describes phosphatidylcholine containing 36 carbon atoms and one double bond in the fatty acid chains. The online version of this article (doi: 10.1007/s10337-014-2787-5) contains supplementary material, which is available to authorized users. The role of lipids in pulmonary inflammatory diseases has gained increasing interest in recent years [1, 2, 3, 4, 5, 6]. Previously, solely seen as essential components of membranes and energy sources, lipids are now regarded as important components of the immune response either by organizing signaling complexes in membranes such as lipid rafts  or by influencing the immune reaction by release of lipid-derived mediators such as arachidonic acid derived mediators  or sphingosine-1-phosphate . Recent results indicate that changes in the lipid content of the airway epithelium play an important role in chronic airway diseases such as cystic fibrosis, COPD, and asthma. In cystic fibrosis, an increase in ceramide amounts was detected in the airway epithelium and was linked to inflammation, cell death and infection susceptibility . Recent studies indicate that epithelial lipid metabolism is also changed in asthma [6, 10, 11]. For example, increased amounts of ceramides were detected in the airway epithelium of a guinea pig model as response to the induction of experimental allergic asthma . Further support for an important role of lipid metabolism was found by genome wide association studies that identified the Orosomuid 1 like 3 (ORMDL3) gene to be strongly associated with childhood asthma . ORMDL genes, which regulate ORM protein expression, are expressed in airway epithelial cells  and their expression is strongly increased in response to allergen challenge . Functional studies have shown that the ORM families of proteins are regulators of the sphingolipid biosynthesis  pointing towards an important role of sphingolipids in the sensitization phase of asthma. Studies that identified the airway epithelium as cellular source of sphingolipids relied only on immunohistochemistry. Although immunohistochemistry is able to detect the cellular source of single lipids, only very limited information can be gathered regarding the amount of lipids as well as the lipid composition in these cells . However, this information is crucial to understand the molecular mechanisms that underlie changes in lipid composition and possible cellular consequences of therapeutic interventions. Recent advances in mass spectrometry have allowed identifying and quantifying a variety of lipid classes simultaneously. In the shotgun lipidomics approach lipid extracts are analyzed in direct infusion experiments solely relying on the performance of the tandem mass spectrometer utilized (MS/MS) [17, 18, 19]. This approach is fast and reliable for profiling lipidomes of a variety sample types [20, 21, 22]. However, lipid extracts containing considerable amounts of impurities, cannot be analyzed by shotgun lipidomics due to ion suppression effects. In such cases, liquid chromatography–mass spectrometry (LC–MS)-based methods are chosen [23, 24, 25, 26]. The LC-separation as second analytical dimension is a must for the quantitation of very low abundant molecular species and lipid-derived signal molecules [27, 28, 29]. Here, we present a new lipidomics approach to determine the lipid content of airway epithelial cells, which was extensively tested in a mouse model of experimental asthma and applied to clinical samples. This method has previously been used to determine epithelial mediator mRNA expression  and was now optimized for lipid analysis using LC–MS. Epithelial cells were isolated with a sterile swab and was processed for the analysis by either normal phase (NP) or reversed phase (RP) LC–MS using high resolution Fourier transform ion cyclotron resonance mass spectrometry. All lipid standards with purities greater than 99 % were obtained from Avanti Polar Lipids (Alabaster, AL, USA). Deionized water was prepared with a Milli-Q purification system (Schwalbach, Germany); the conductivity of the water was less than 0.06 µS cm−1. All other chemicals (at least HPLC grade) were obtained from Sigma Aldrich (Traufkirchen, Germany) and used without further purification. Female Balb/c mice aged 8 weeks were treated intranasally with a crude extract of house dust mite (HDM) (Greer, Lenoir, NC, USA) in PBS (100 µg/50 µL) (n = 6) or PBS alone (n = 6) on days 0, 7, and 14. On day 15, the tracheae were removed and the epithelium was isolated as described below. Experiments were performed in two independent batches. All animals were held according to institutional guidelines with a 12 h day/night cycle and food and drink ad libitum. All animal experiments were approved by the Regierungspräsidium Giessen (Landgraf-Philipp-Platz 1-7, 35390 Gießen, Germany) and measures were taken to keep animal suffering to a minimum. To isolate the tracheal epithelium, the mice were killed by an overdose of isoflurane. The trachea was removed, transferred to a small cork plate with the tracheal muscle facing upwards and were fixed in position with insect needles. Hepes-Ringer solution was constantly applied to prevent drying of the tissue. Then, the tracheal muscle was cut using Vannas-Tübingen spring scissors and the tissue was flattened using additional insect needles. The epithelial surface was cleaned by rinsing repeatedly with HEPES-Ringer solution. Excess fluid was drained using a pipette without touching the epithelium. The epithelium was gently removed using a sterile swab (Single Polyester Fiber-Tipped Applicator Swab, Becton–Dickinson, Heidelberg Germany). The tip of the swab was cut with a sterile scalpel, transferred to a 1.5 mL Safe-Lock Eppendorf tube (Eppendorf AG, Hamburg, Germany), shock-frozen in liquid nitrogen and stored at −20 °C until the analysis. After removal of the murine epithelium, the trachea on the cork plate was transferred to a vial containing 2 % (v/v) glutardialdehyde, 0.6 % (w/v) paraformaldehyde, and 0.03 % (w/v) CaCl2 in 0.06 M cacodylate buffer, pH 7.3521 and fixed for at least 24 h. Then, the tissue was rinsed with cacodylate buffer, dehydrated in increasing concentrations of acetone, critical point dried, sputtered with gold and evaluated using a scanning electron microscope. Using ImageJ the total amount of epithelium removed from each trachea was calculated in 10 tracheae. To further evaluate the procedure, tracheae from mice which were not treated intranasally were treated as described above but were processed for transmission electron microscopy after fixation. First, they were additionally fixed with osmium tetroxide, dehydrated with increasing concentrations of alcohol, transferred to propylene oxide and embedded in Araldite resin. Ultrathin sections were cut, transferred to grids, stained with lead citrate and uranyl acetate and evaluated by transmission electron microscopy. Mice tracheal epithelial cells on swabs were extracted according to Bligh and Dyer . Briefly, 40 µL water were added to the swab and mixed with 100 µL of methanol and 50 µL of chloroform (sample/methanol/chloroform = 0.8/2/1 by volume). The mixture was vortexed and sonicated for 10 min. After 25 min at room temperature, 50 µL of water (1 volume) and 50 µL of chloroform (1 volume) were added, vortexed and centrifuged for 10 min at 400×g. The lower organic phase was transferred to another vial and the water phase was re-extracted two more times with 50 µL of chloroform (1 volume). Organic phases were pooled, solvent was removed in vacuum and samples were stored at −20 °C. Prior to analysis, dried samples were dissolved in 100 µL of chloroform/methanol = 86/13 (v/v) and 25 µL of the reconstituted sample was mixed with 25 µL of a mixture of deuterated lipid standards (1.43 ng µL−1 per species, consisting of 16:0 D31-18:1 PI, 16:0 D31 Cer, 16:0 D31-18:1 PG, 16:0 D31-18:1 PE, 16:0 PC D62, 16:0 D31-18:1 PS, 16:0 D31 SM). Human bronchial samples without pathological findings were obtained from lung lobes that were removed during surgery from one female and two male adenocarcinoma patients (age: 61–77 years). Pieces of the main bronchi were removed, cut open, fixed with needles on a cork plate and remaining mucus was removed. As described above for mouse tracheal epithelium, bronchial epithelial cells were removed with a sterile swab. In addition, whole bronchial tissue samples were also obtained. For each patient at least five epithelium samples were processed. After isolation, samples were extracted as described below. The use of patient materials was approved by the ethics committee of the University of Lübeck (AZ 12-220). Prior to lipid extraction, human lung epithelial cells on swabs were moistened with 100 µL of water and human bronchus tissue samples were homogenized in a 20-fold excess of 50 mM KCl. From this tissue homogenate 50 µL were processed for lipid extraction, which corresponds to approximately, 2.5 mg of tissue sample. After the addition of 50 µL of the internal standard mixture (5 ng/µL per species, consisting of 16:0 D31-18:1 PI, 16:0 D31 Cer, 16:0 D31-18:1 PG, 16:0 D31-18:1 PE, 18:0-18:0 PC-OO, 16:0 D31-18:1 PS, 16:0 and D31 SM), lipids were extracted from the samples according to Bligh and Dyer . Dried samples obtained after extraction were stored at −20 °C until LC–MS analysis. Prior to NP-LC–MS analysis, the residue was re-dissolved in 200 µL of chloroform/methanol = 86/13 (v/v). For RP-MS analysis, 50 µL of this solution were dried in vacuum and the dried residue was re-dissolved in 50 µL of methanol containing 0.1 % ammonium acetate. An Agilent 1100 HPLC system (Agilent, Waldbronn, Germany) was used for the separation of the phospholipids on a 150 mm BETASIL Diol-100 column with a particle size of 5 µm (Thermo Fisher, Bremen, Germany) and 0.32 mm inner diameter using 5 μL injection volumes. The solvents, gradient profile and flow rates are summarized in supplementary Table 1. For the analysis of neutral lipids in the clinical samples, the Agilent 1100 HPLC system was used for the separation of the lipids by reversed phase HPLC on a 150 mm Biobasic C18 column (Thermo Fisher) with a 0.32 mm inner diameter using 5 μL injection volumes. The solvents, gradient profile and flow rates are summarized in supplementary Table 2. All mass spectrometric analyses were performed on a high resolution Bruker Apex Qe FT-MS (Bruker Daltonics, Bremen, Germany) equipped with a 7 Tesla actively shielded magnet and an Apollo Dual ESI/MALDI ion source. For TAG analysis, full scan MS data were acquired in the first 40 min of the LC acquisition in the positive ion mode. For the phospholipid analysis, full scan MS data were acquired in the first 60 min of the LC-run. Instrumental parameters were as follows: source temperature at 200 °C, −3.8 and 4.5 kV ionization voltages for negative and positive ion mode analysis, respectively. For human lung samples 1 M data points sampling rate and 1 s accumulation time for each scan was used and the nebulizer gas was set to 1.0 L min−1, drying gas was set to 5 L min−1, and TOF time parameter was set to 0.0014. For mouse epithelium samples 512 k data points sampling rate and 0.6 s accumulation time for each scan was used, where 2 microscans were averaged; nebulizer gas was set to 1.3 L min−1, drying gas was set to 3 L min−1, and TOF time parameter was set to 0.0021. Data acquisition was performed using the HyStar 3.2 software (Bruker Daltonics). NP-LC–MS and RP-LC- MS data files were processed using Bruker’s Data Analysis 4.0 software. Mass spectra were averaged in the retention time ranges of lipid classes of interest (defined by the elution time of the internal standards). Each mass spectrum was smoothed, baseline subtracted and finally peaks lists were extracted (m/z values and corresponding intensities). Lipids were identified by their monoisotopic masses with an accuracy better 5 ppm using LipidXplorer  and their respective retention time window. If available, intensity ratios of lipid species and their corresponding deuterated internal standard were used for quantification of lipids in the sample. DAG and TAG were quantified using 36:0 PC-OO as standard, which eluted closest to the elution time range of both lipid classes in the RP-LC–MS. Statistical tests were performed using GraphPad Prism version 6.00 for Windows, (GraphPad Software, San Diego, CA, USA). A significant difference between lipid species in the two data sets was assumed if p < 0.05 for the Mann–Whitney U test. After trachea removal and rinsing the surface, the epithelial cells were obtained by gently skimming the epithelium using a sterile swab. 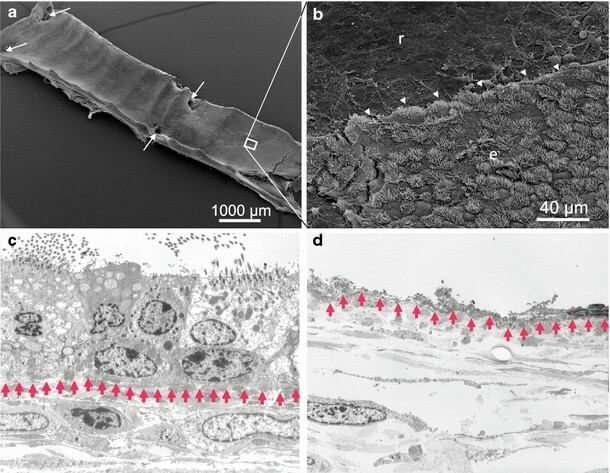 To verify selective removal of epithelial cells from trachea samples, scanning electron microscopy and transmission electron microscopy experiments were performed. These experiments verified that the swab removed the epithelium without destroying the subepithelial dense fiber network and without reaching deeper parts of the tracheal tissue (Fig. 1). No remaining mucus or other material was detected on the remaining epithelial cells. As judged by the area of missing epithelium in the trachea we estimated that in average 5.23 ± 0.12 mm2 (n = 10) was removed using the swab. Such area would correspondent to approximately 80,000 cells, which subsequently were processed for lipid extraction and LC–MS analysis. Initially, we intended to analyse swab lipid extracts in a shotgun lipidomics approach allowing high-throughput sample analysis. Unfortunately, analyses without pre-separation were not successful due to contaminants from the swab plastic material, which gave rise to two major peaks at m/z 594.1605 and m/z 1170.2883 in the positive ion mode. These contaminants made a sensitive lipid quantitation impossible due to strong ionization suppression. Note, several other swabs made from different material were tested but showed even higher chemical background. To overcome these issues and to allow automated data analysis using LipidXplorer, an NP-LC–MS method was implemented. The sensitivity and reproducibility of the NP-LC–MS method for phospholipid analysis was estimated using a lipid standard mixture containing Cer, PG, PE, PI, PS, SM, and PC. The limit of detection (LOD) for all lipids was in the range of some hundred fmol on column (supplementary Table 3). For PS the LOD was in the low pmol range as this lipid class elutes very late under the chosen chromatographic conditions resulting in peak broadening and reduced signal intensity in the resulting mass spectra. To identify and quantify lipids using NP-LC–MS analysis, all mass spectra in the elution time range of a specific lipid class of interest were averaged. Thus, retention time stability is of crucial importance for automated data analysis. Retention time stability was determined from 25 subsequent analyses for the three standard lipids eluting at different retention times (16:0 D31 Cer at 1.2 min, D31-18:1 PE at 14 min, 16:0 D31-18:1 PS at 32 min) and found to have only relative standard deviation of 5 %. 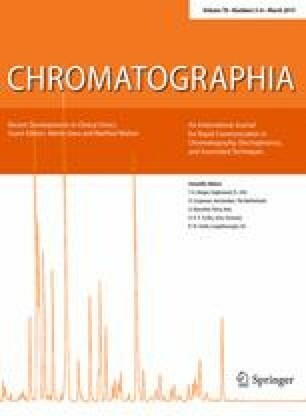 It should be noted that retention time ranges used for quantification of phospholipids were adjusted for each batch of samples analysed as retention time discrepancies were observed between different column batches and mobile phase preparations. In our study, sets of up to 30 epithelium samples were measured and mass spectra for specific lipid classes could automatically be processed because the retention times within one batch remained stable despite matrix effects (see supplementary Fig. 1). The established workflow for the analysis of lipids from airway epithelial cells is summarized in Fig. 2a. Epithelial cells are removed from the trachea using a sterile swab and lipids are extracted using standard extraction procedures. Extracts are analysed using NP-LC to separate chemical contaminants of the swabs from the lipids. High resolution ESI-FT-ICR-MS spectra were acquired online and within defined retention time windows for each lipid class one mass spectrum was obtained (Fig. 2b). Peak lists were computed with standard spectra processing tools, which were used as input for lipid identification using the LipidXplorer software. Lipid quantitation was achieved using the response of an internal standard that co-eluted with the lipid class of interest. For the analysis of lipids extracted from murine tracheal epithelial cells, a chloroform-based solvent system was used for separation of lipids on a normal phase column . Use of this solvent system favors formation of [M + Cl]− ions of ceramides while the [M-H]− ions are barely detectable in the negative ion mode as is shown in supplementary Fig. 2a. In the positive ion mode, [M + H]+ ions of ceramides are formed (supplementary Fig. 2b) but with comparably low ionization efficiency. (supplementary Fig. 2a, b). In addition, swab contaminants co-eluted with ceramides and were detected at high abundance in the positive ion mode. As a result of these observations, we choose to quantify ceramide species as chloride adducts in the negative ion mode, which was also reported earlier [33, 34, 35]. In the present work, we analysed lipids in epithelial cells obtained directly from murine trachea. From approximately, 80000 cells collected, 99 lipid species belonging to seven different lipid classes were identified and quantified in pmol/sample. SM and PC were found to be the major components of epithelial cells of the mouse trachea with approximately 68 molpercent (PC and PC-O: 41 %, SM: 26 %) followed by PE and PE-O (19 %). As minor components of the membrane lipids, PI (6 %), PS (4 %), PG (1 %) and Cer (1 %) were identified (supplementary Table 4). Sphingolipid metabolic perturbations were recently implicated as important risk factors for childhood asthma . In this regard, we tested if our method could help to assess lipid metabolic changes in the epithelia between house dust mite challenged mice (HDM) and control animals (PBS) (Fig. 3). Here we could observe that ceramides were predominately changed on the lipid class level after HDM challenge. A closer look into the ceramide profile revealed that all species after HDM challenge were increased (Fig. 3 inset). Further prominent changes were found for PC-O 32:0, PC-O 34:1 and PS 34:1 that are significantly increased in HDM challenged animals, whereas PG 34:2 and PG 32:1 are significantly decreased when compared to control mice (supplementary Table 4, p < 0.05, Mann–Whitney test). Encouraged by the results of the mouse model we tested whether our method could in principle also be applied for the human bronchial epithelium. Subsequently, epithelium cell samples were obtained from different locations of explanted bronchial tissues of confirmed adenocarcinoma patients that did not show histological alterations in the excised bronchi. The abundance of selected lipid classes in the bronchus epithelial cells obtained from three different patients is shown in Fig. 4. For the analysis of the human airway epithelial cells approximately, a tenfold higher amount of biological material can be obtained as compared to the murine trachea. That further resulted in an increase of lipid identifications to approximately, 300 lipids (supplementary Table 5). For all patients, epithelium samples were isolated on at least five locations of the bronchus. It further enabled us to determine the variability of lipid profiles for the three individuals. For all patients, PC was found to be the most abundant lipid class followed by PE plus PE-O. For patient 2 a high variability compared to the other patients was detected in the lipid content of TAG, SM and Cer, which cannot be attributed to a specific functional or clinical parameter. In future studies, the number of patients has to be increased to access the inter- and intra-individual lipidome variability to draw functional associations. We further tested the specificity of the isolation technique by comparing whole bronchial tissue samples with isolated epithelium samples (Table 1). On level of the lipid class distribution the strongest difference can be found in reduced TAG amounts in the epithelium, which is related to peribronchial adipose tissue. We further observed a clear increase in abundance for Cer, PE-O and PE levels in the epithelium (Table 1). A closer look into the Cer and SM profiles revealed a shift towards shorter acyl chains for the epithelium samples (Fig. 5 a, b). This effect is more prominent for the ceramides where Cer 34:1 abundance is increased by a factor of 2 compared to the whole bronchus. It is further an important observation that Cer is the predominant sphingolipid in the epithelium, which was not expected. For many respiratory diseases are mouse models established, which help to investigate fundamental processes in disease progression [37, 38, 39, 40]. Here we present the first comparison of the lipid composition of mouse and human airway epithelium. PC was in both epithelia the most abundant membrane lipid (Fig. 6a). A striking difference was observed in the abundance of SM, which in the mice is as nearly abundant as PC. For the human epithelium we observed that Cer is the most abundant sphingolipid and approximately, tenfold more abundant compared to the mouse. Further changes were found for the PC-O content, which was significantly decreased in the human airway epithelium whereas for PG a slight increase of 25 % was observed. In context of the importance of sphingolipids we like to underline that the acyl chain distribution in ceramides as well as sphingomyelin is very different (Fig. 6b, c) between mouse and human airway epithelium. For the human as well mouse airway epithelium the Cer 34:1 and SM 34:1 are the predominant species. But long chain sphingolipids make up a higher proportion in the mouse epithelium, which can be best recognized for Cer 40:1, Cer 42:1 and SM 42:2. The functional impact of such global lipid changes is until now out of our reach, but might be of importance in the future when results of animal models are translated for clinical application. A method was developed to investigate the lipid composition of lung epithelia using a sterile swab for cell isolation and LC–MS for quantitation. The approach was tested in a mouse model of experimental asthma and human samples. Even though standard plastic consumable were utilized for the isolation of the epithelia this method allowed quantifying many important membrane lipids. In this way, a molecular snapshot of the lipid metabolism of the airway epithelium can be derived, which will help to investigate the influence of the lipid metabolism on lung diseases. To our knowledge, we report for the first time the lipid profiles of phospholipids, sphingolipids and neutral lipids of airway epithelial cells. Our method is sensitive enough to quantify ceramide species in the airway epithelium. In general, ceramides and sphingolipids are implicated as key molecules in the development of asthma and inflammatory processes [6, 11, 36]. Our observation of increased ceramide amounts in allergen-challenged mice supports this finding. This view is also supported by a recent study in which inhibition of Cer synthase resulted in a decrease of Cer levels in lung tissue samples in a guinea pig model of experimental asthma and reduced asthmatic hallmarks in challenged animals . For the analysis of intrapulmonary airway epithelium of mice, however, our technique will be of limited use due to the large size of the sterile swab. To improve the depth of lipidomics studies, other techniques to isolate the epithelium have to be found. The use of laser capture microdissection can be a promising approach to study lung tissue sections  as well as MALDI-based mass spectrometric imaging . To further enhance the impact of such studies we will expand our approach to LC–MSn-based techniques that enable us to measure secondary messenger like lipid mediators, sphingosines and lyso-lipids . We have shown that this method is also applicable to specifically analyze the lipid composition of human epithelial samples obtained from explanted lung samples. Since epithelial brushings can be performed by bronchoscopy, our method could be a useful tool to study the lipid metabolism of the human airway epithelium of patients. We developed a LC–MS-based method that can become a valuable tool to investigate the role of lipids in the airway epithelium in context of respiratory diseases. The approach is applicable for mouse model as well as to profile lipids of the human airway epithelium. Our method can in principle be used to analyze lipid profiles of epithelium cells obtained by epithelial brushings performed during bronchoscopy. We see here the possibility to utilize this platform technology for clinical application. The financial support by the DFG (SFB TR22 Z01 to BL; SFB TR22 Z06 to DS; TR22 Z05 to PK) and the German Ministry for Education and Research (82DZL00102 to PK) is gratefully acknowledged. Human lung tissue samples were obtained by the BioMaterialBank Nord, which is funded in part by the Airway Research Center North (ARCN), Member of the German Center for Lung Research and is member of the popgen 2.0 network (P2N), which is supported by a grant from the German Ministry for Education and Research (01EY1103). We thank Dr. med Christian Kugler (Großhansdorf Hospital) for providing human tissue samples. We thank Gudrun Knebel for expert technical assistance.